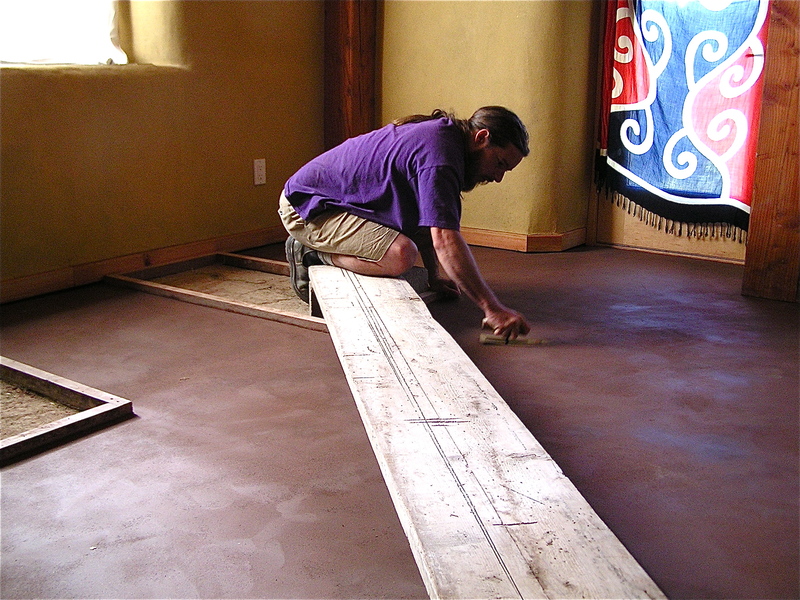 The south room floor is the one spot in the house where we continued with our plan for laying out an earthen floor, in hopes of capturing the heat of the southern sun that streams in during the winter months. 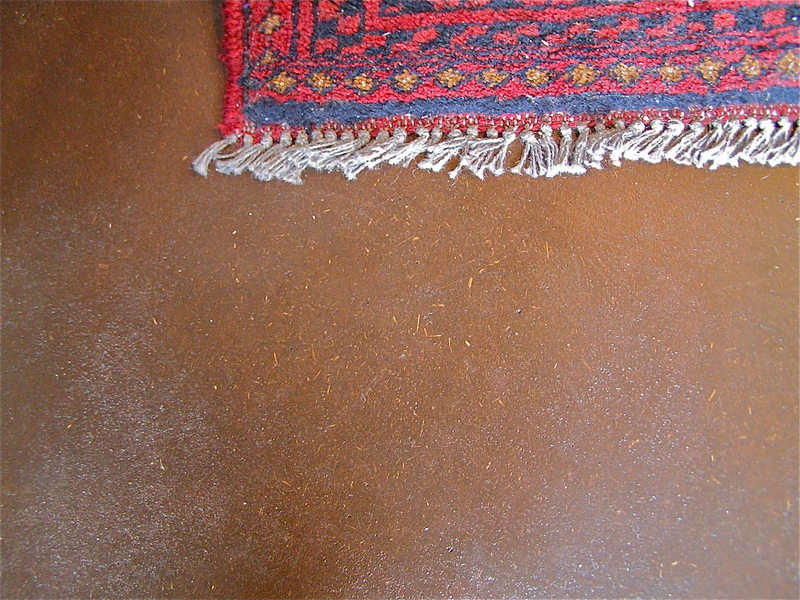 The rest of the house, which was originally intended to be an earthen floor, became cork flooring due to some time pressures and uncertainties regarding the success of the earthen floor process. (See my previous post titled The Layers Beneath Our Feet for a total description of the floor.) We found lots of information, tips, recipes, ideas, things that didn’t work, and things that did from a variety of resources, some of which contradicted each other, or were from climates very different from ours, or which used materials that were unavailable or too expensive for us. Figuring out what to do was challenging. 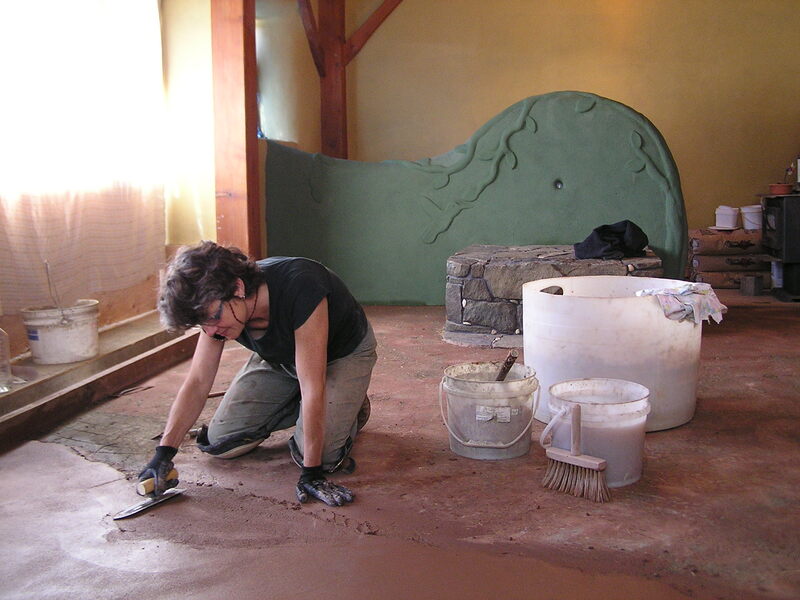 Tracy joined us again for the experience of mixing and laying our earthen floor, and we are grateful to her for sharing her observations and experiences of working with natural plasters. 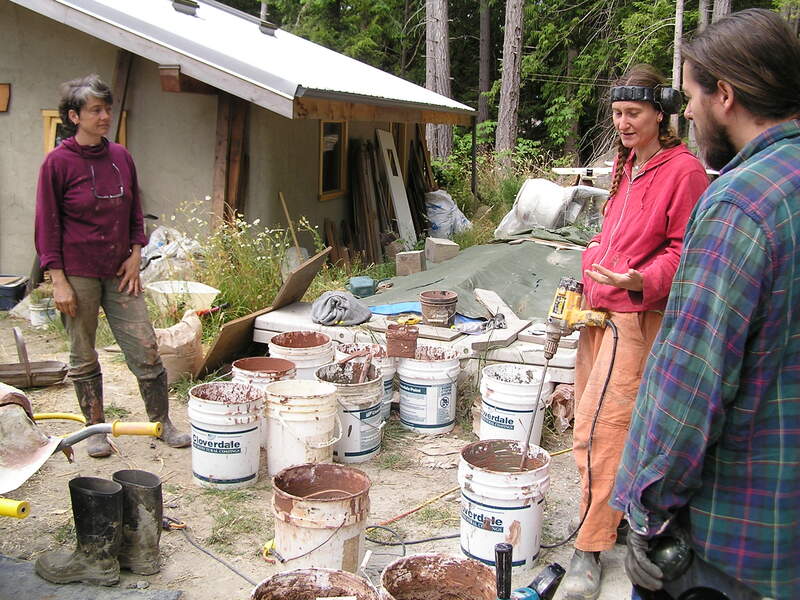 (Tracy is our natural plaster and straw bale teacher.) 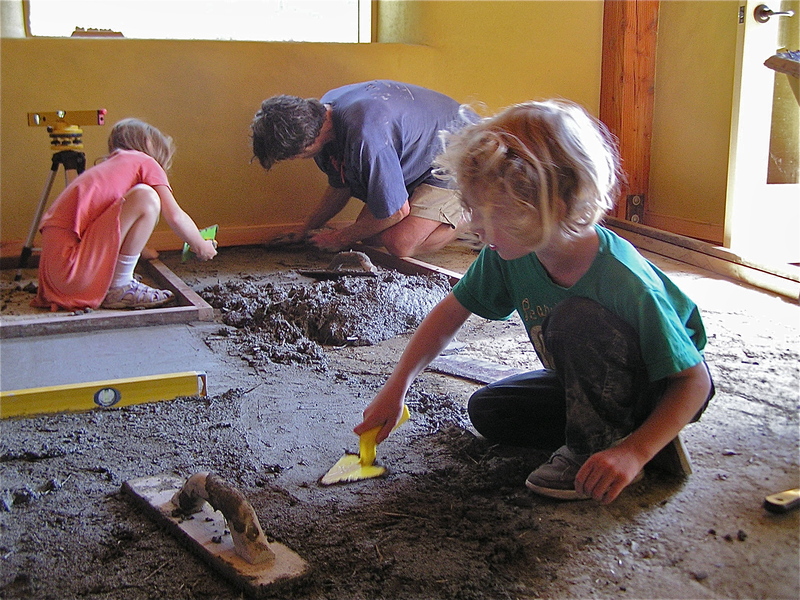 We wanted to use what we had and we felt most comfortable with techniques that were familiar to us from the wall plastering that we had just completed. Cracking seemed to be the biggest common result, and one that is difficult to fix without a very messy look. 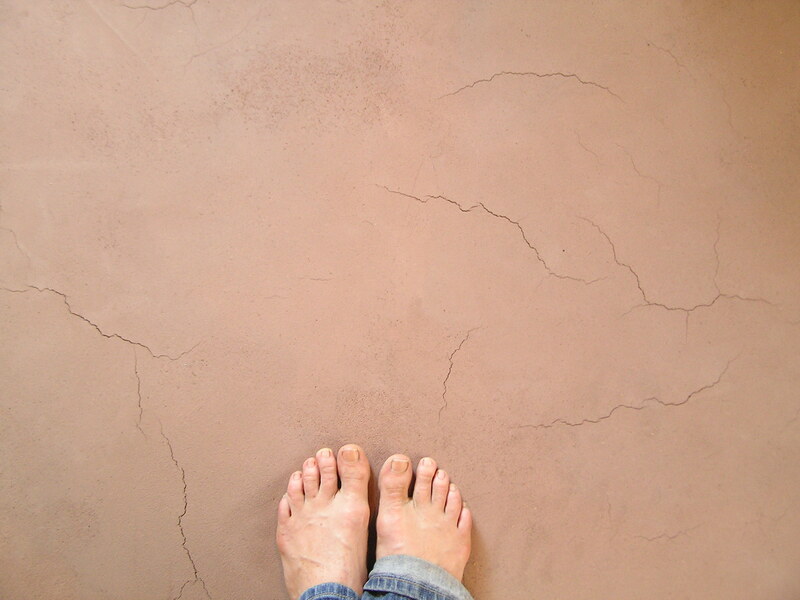 We heard of filling the cracks with different coloured plaster to create a marbled look, but we never found a source of a good example of this method. A certain amount of experimentation, intuition, applied knowledge and trust was going to be needed. This was the point at which we were grateful that it was now only a small 200 square feet that we had to do. 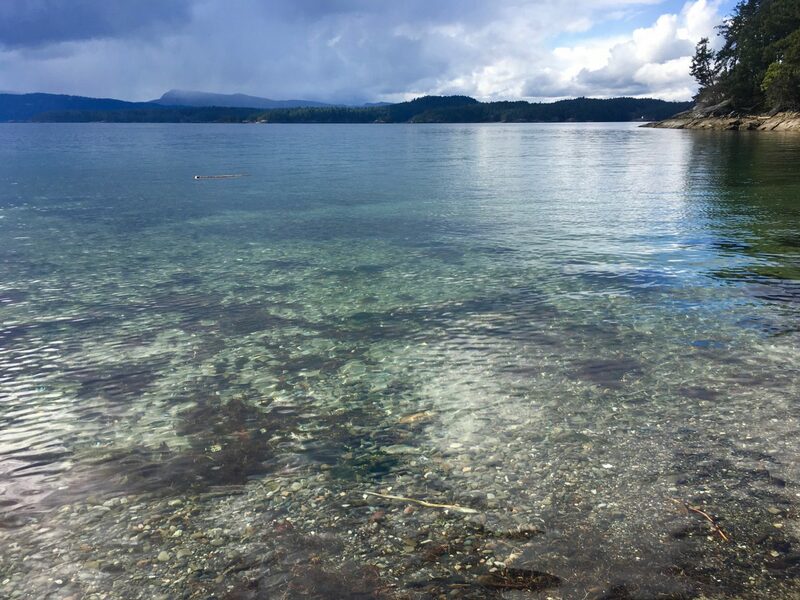 We decided to follow (loosely) a set of well laid out steps and recipe ideas from Anne and Gord Bailey, of Eco-Sense on Vancouver Island, ecosenseliving.wordpress.com. 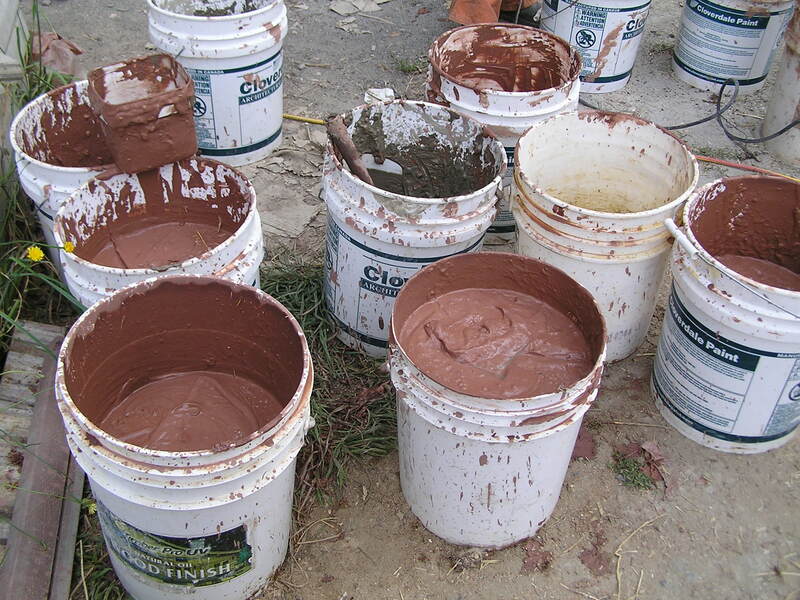 We adapted the recipe to what we had available, which was screened clay mixed into a slurry, red clay mixed into a slurry, stucco sand, horse manure, straw, and some red pigment. 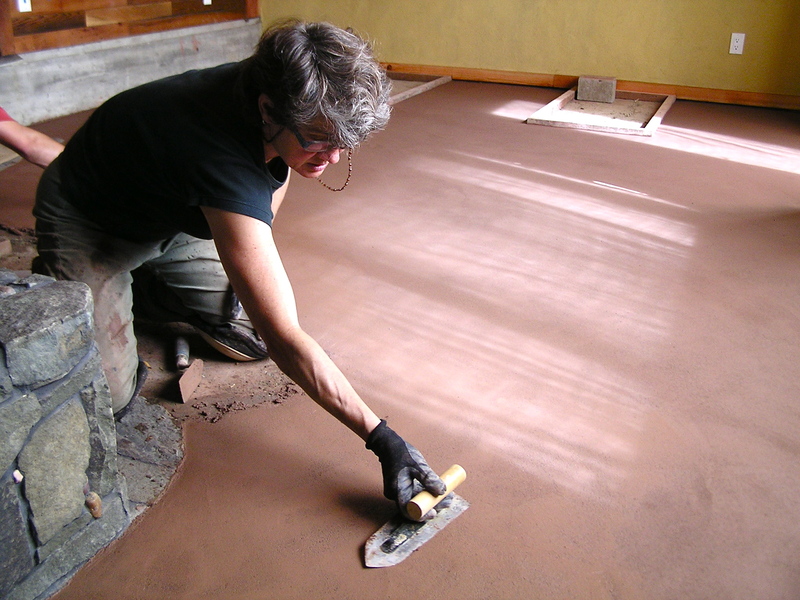 We started by laying down a cob sub floor at a depth of 3/4 inch using a mix that resembled our second coat of wall plaster. When that was dry we mixed up the top layer in 5 gallon buckets, then tried a technique we saw on the internet of laying burlap all over the floor area, wetting it and slopping clay slip as a binder then troweling on the 1/4 inch thick top layer. I am breezing through the details here because it didn’t work. 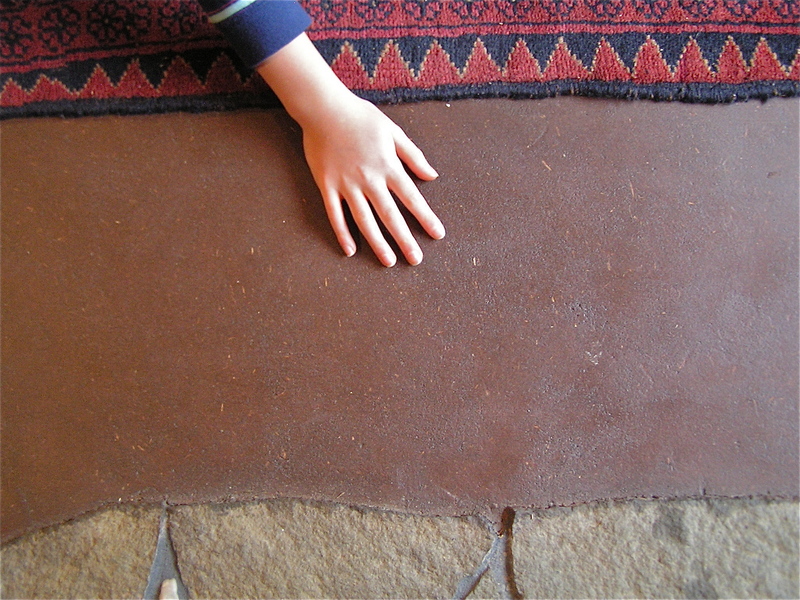 We thought that the burlap would help reduce the shrinkage factor of the clay that leads to cracking, but it didn’t at all, and it also prevented the top layer from bonding well to the layer below the burlap. We think it dried too fast, the layer was not wet enough, the burlap wasn’t soaked well enough, or there was just too much clay content in the mix to begin with. So we ripped it up! Just chipped through to the burlap and pulled, and it lifted too easily. We crumbled it back into the buckets, then worked out a few new ratios of higher sand and straw contents. We laid out some sample areas and let them dry to see how the cracking went, and decided to make the mix with 4 parts sand, and one part clay slip. Because of the remixing, it is hard to say what the quantities were for the various other ingredients. 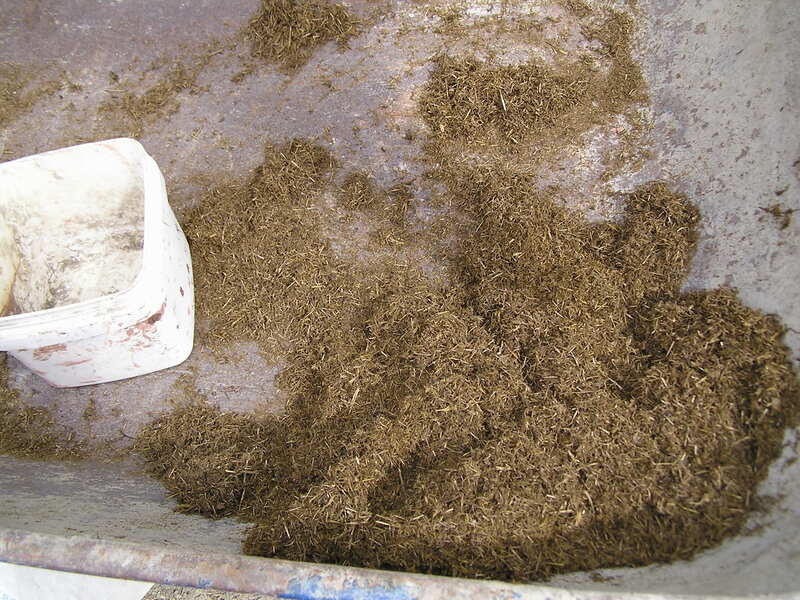 Fibers (manure and straw) were around 1 1/2 parts, and water content was based entirely on feel and how the mixer spun. Not too wet, not too runny. This time we left out the burlap. 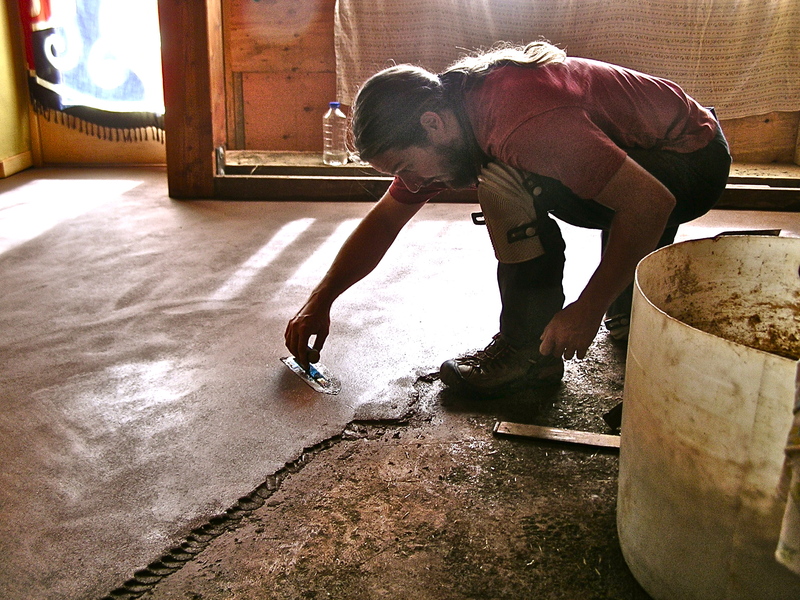 We also poured buckets of water all over the floor the night before to keep the cob subfloor cool and to prevent it from sucking moisture out of the layer we troweled on top. We hung blankets over the windows to try to keep the summer sun from hitting it right away. It took a whole day of two people troweling on hands and knees to get our 200 square feet covered once again, then while it slowly dried we lay planks across the floor so we could burnish it, giving it a polished look while compressing it more, and hoping to prevent too many cracks. The outcome was 90% better than the first try. We had a few thin cracks, mostly where it dried the fastest, and no lifting. The recommended method for fixing the cracks was to use some left over plaster. We dried it out, crushed it, screened it through window screen, then sprinkled it into the cracks while wetting the area with a mister and troweling it smooth as best as we could. There was a bit of texture difference for sure, but we decided that it was a natural floor overall and a bit of texture was fine! Then we began with the oiling and waxing. This was another reason we were glad to have done only a small portion of our floor- we brushed on 3 coats of boiled linseed oil, and two coats of Land Ark oil, which contains beeswax, tong oil, linseed oil, citrus extract, and pine rosin. Land Ark is made with only natural, non-altered ingredients from sustainable resources, without chemical processing, bleaching, or harmful additives. We have also used it on the timber frame,door and window trims, the baseboards, and the ceiling boards. It actually feels great to get on my skin, and I love the smell of it as I have done much of the staining. For more info on a great product- www.landarkwoodfinish.com. 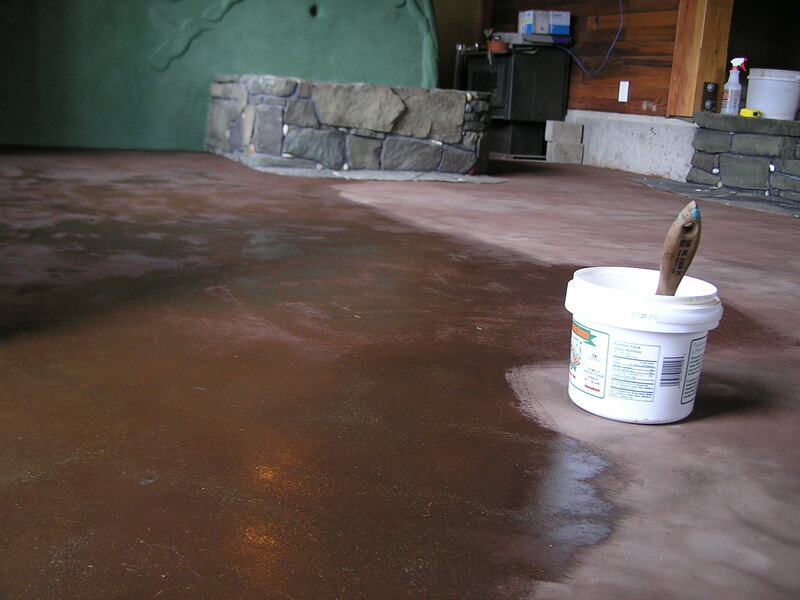 The cost of this oil runs at about $85 a gallon, so we were hesitant about what it may have cost in oil to finish a larger area of floor, since we didn’t know how many coats the floor would take. We read that it could be anywhere between 3 and 10, with at least 2 being the straight linseed oil. 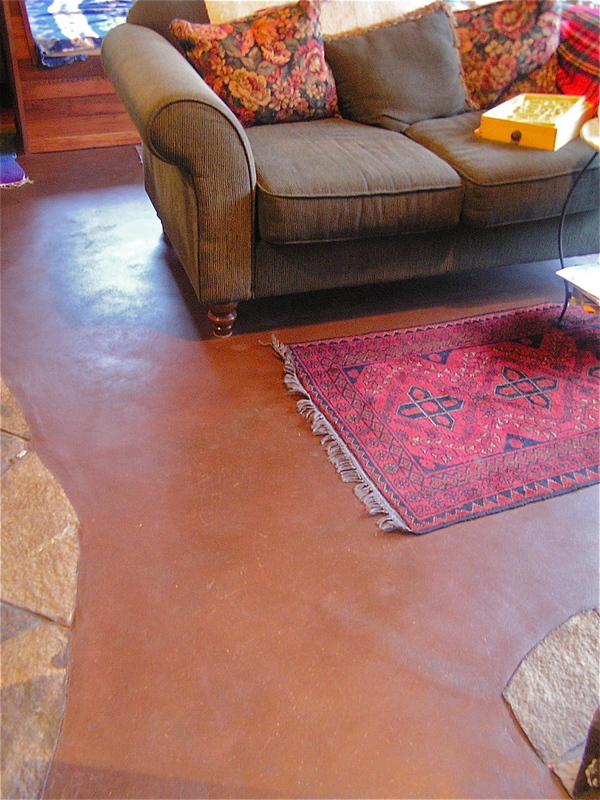 Then we waxed the floor, using another natural wax from Land Ark, and then buffing it hard with a buffer. The golden flecks of straw suddenly jumped out, and the places of various texture and colour deepened and settled in. 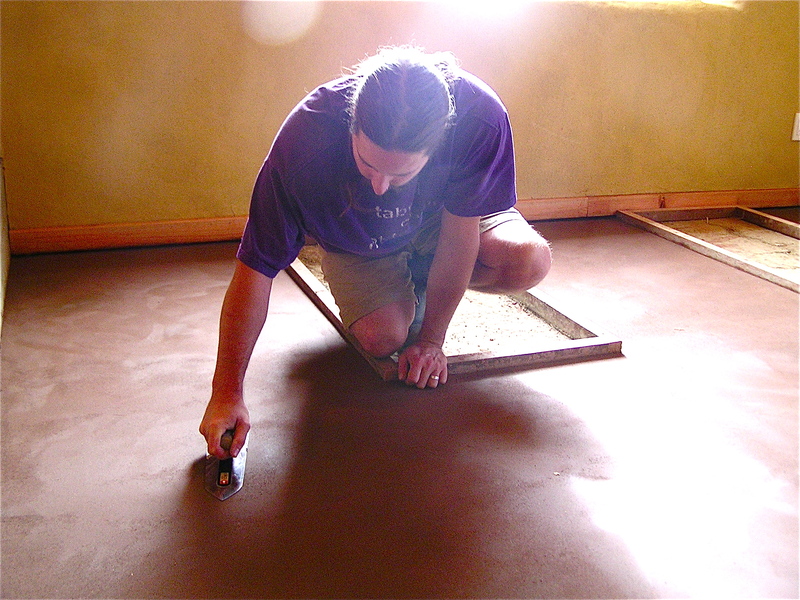 The best part of the finishing of the floor was not anything that we read or heard about in all of our earthen floor research, and so here I would like to add it in as a recommended part of laying an earthen floor. Don’t move in any furniture, but set up the stereo. Lite some candles, build an altar, and invite as many people as can dance on your floor. Put on a rocking playlist, strip off the socks and stomp, swirl, boogie, laugh, and send all that energy of celebration, gratitude, and joy through the soles of your feet into the hard work and beauty of the earth. That’s what we did, quite unexpectedly. We felt warmly supported by our friends, and happy to finally be able to open our space for gathering together and sharing what we have. Do you find the linseed oil left you with a strong smell in your home? I helped put in one a little over a year ago, and a neighbor put in one three or so years ago, and both are so strong that sensitive friends cannot visit. I’ve visited others that do not have this problem. My inclination is that it was the quality of linseed oil. How does yours smell? We haven’t experienced any smell at all. The boiled linseed oil was used only for the first 3 applications, being left to dry before each layer. Then we used a mixture of linseed with citrus, pine, beeswax and tong oil, for another 2 coats. Then we buffed it with beeswax. My thought is that the other ingredients may have covered the smell, or rather sealed it into the floor. I remember reading about the importance of boiled linseed oil, as otherwise it will be rancid really fast.